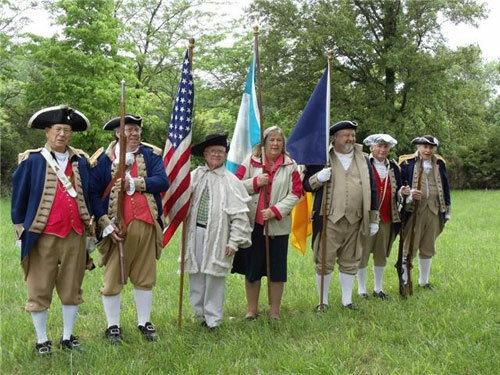 Shown here is the MOSSAR Color Guard team participating at the Hannah Cole Grave Marking Ceremony, along with the Hannah Cole Chapter, NSDAR, in Boonville, Missouri on Friday, May 29, 2010. The Hannah Cole Chapter of the DAR, which was the sixteenth chapter in Missouri, was organized on June 17, 1906, under the name of Jemima Alexander Sharpe, in honor of the Revolutionary ancestor of Jennie D. Andrews (Mrs. Charles), Regent, who served from 1906 until 1912. In 1932, the name of the chapter was changed to the Hannah Cole Chapter, in honor of Hannah Cole, the first white woman to settle in Cooper County. Hannah Cole's husband was killed by Indians on the trip west, so Hannah continued the journey to Cooper County, Missouri with her nine children. She built a fort on a bluff overlooking the Missouri River. In the fall of l932 a granite boulder monument was placed at her grave located in Briscoe Cemetery, 12 miles south of Boonville on Highway 5. (L-R) Major General Robert L. Grover, MOSSAR Color Guard Commander; Captain James L. Scott; Compatriot J. Wayne Merrill; Sandra Shrout Riggle (Mrs. Robert), Hannah Cole Chapter Regent; Major General Robert Capps, KSSSAR Color Guard Commander; Compatriot Al Paris, and Compatriot Fred Kaffenberger. Major General Robert Capps and Compatriot Fred Kaffenberger are from the Delaware Crossing Chapter of Kansas.